A throwback to the days when you thought life was so hard, but now realize it was the best time of your life! 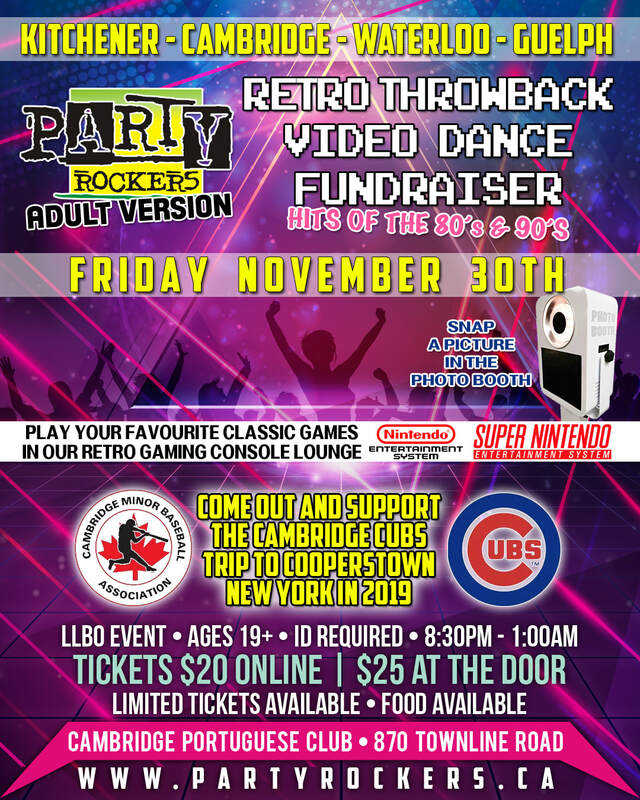 Party Rockers and Cambridge Cubs (CMBA) are hosting a “Retro Throwback” Video Dance Fundraiser at the Cambridge Portuguese Club on Townline Road. This will be a LLBO event. All patrons must be legal drinking age. Government ID required. Get a group of friends together for an amazing night of partying and dancing with two video screens displaying all your favourite hits of the 80s and 90s. Make it a ladies night out or drag the guys out for a enormous amount of fun. Come play some classic games in our video game console lounge. Capture the moment in our retro photo booth and much much more. The Portuguese Club will be serving up the drinks and selling their traditional foods and their famous poutine throughout the night. The Cambridge Cubs are using this fundraiser to help offset the expenses of sending the team to Cooperstown this spring. Each season CMBA sends the Minor Peewee Tier 1 travel team to Cooperstown, New York, to compete in the prestigious Dreams Park Tournament.